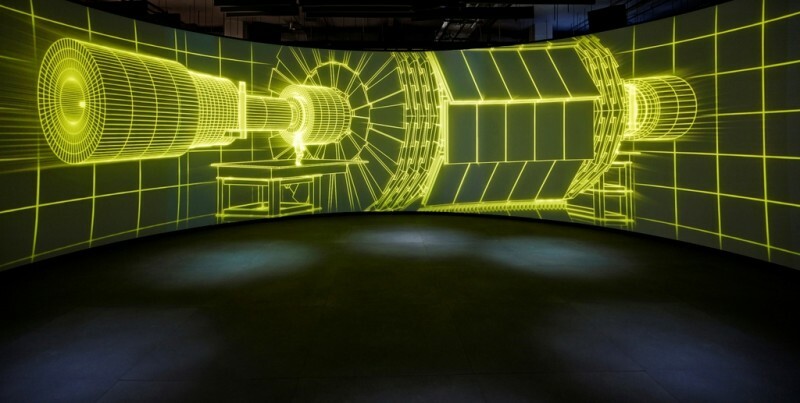 Collider, the Science Museum’s latest temporary exhibition, gives Londoners the chance to step inside a model of the world’s greatest science experiment: the Large Hadron Collider project at CERN (the European Organization for Nuclear Research). It is no exaggeration to claim that the work carried out at CERN is among the most impressive scientific research ever undertaken. The collider consists of a 27km ring of special magnets buried up to 175m underground beneath the border of France and Switzerland. The experiment generates up to 40 million particle collisions per second inside the collider, producing vast amounts of complex data to be analysed in computer centres across 36 different countries, all in aid of furthering human understanding of the 96% of the universe that we cannot see or directly detect. It is no mean feat to capture the scale and importance of the collider experiment for a general museum audience, but the Science Museum has risen to the challenge with enthusiasm, providing visitors with a simplified but unpatronising summary of the science behind the collider and focusing primarily on the human stories of the researchers involved. A short film at the beginning of the show (which features a brief, light-hearted cameo by Professor Brian Cox in the role of CERN’s coffee boy) takes the audience behind the scenes of the Higgs Boson discovery announcement in 2012, with actors playing scientists to convey the importance of the collider experiment to the international scientific community. After this presentation, visitors are invited to explore the Science Museum’s scaled-down mock-up of the inside of the collider research center, which features real equipment from CERN alongside a well-designed series of information boards and video interviews with project workers, giving insight into their daily lives. There is also an impressive video presentation explaining how the collider functions on a subatomic level, offering visitors the chance to witness a particle collision via spectacular computer graphics. It will take a more scientific brain than mine to confirm if the Science Museum has succeeded in accurately summarising the technical realities of the Large Hadron Collider experiment, but what this exhibition clearly demonstrates is the passion and excitement surrounding the project for those involved, and the importance of the experiment for human understanding of how the universe works. Collider is open until 6 May.